I am a college student who was looking into the small value sedan market (Civic, Jetta, Mazda3, etc.) This was the only car that looked well enough to catch the girls eyes while performing in the snow for the winter time. I would much rather enjoy driving the car than worry about the stereo. 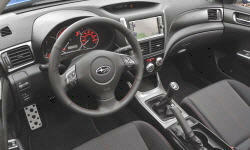 Why the 2011 Subaru Impreza / WRX / Outback Sport? You can't find a better car for $22k that has as any form of all wheel drive off the lot brand new. This car will drive in 4"+ of snow on stock Potenza's without fail. And in the summer, it's just as fun through tight corners on the mountain roads that were iced over just months before. The rear led tail lights give this car an edge. The front projectors (although not fitted with HID) also show this car is designed to be driven and to be seen. I love the White Hatch, I knew its what I wanted and every time I look at it, I smile. I have had zero issues with this car, it performs well for me day in and day out without fail. I love it and I am proud to say I own a Subaru. This car feels confident in tough conditions, its very predictable. The brakes are phenomenal for its class and will get you from 60-0mph quickly. Also includes DSC and Brake Assist on 2011+ standard. Pop those rear seats down and you can move a lot of stuff from home to the frat house. You can easily move a lot of stuff in this car, moreso than if you get a small sedan like a Civic. 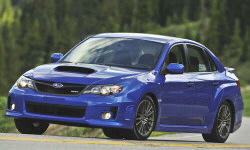 Why Not the 2011 Subaru Impreza / WRX / Outback Sport? The 4 speed auto does not perform efficiently, although it is fast to shift and quite bulletproof. There is no lumbar support which makes it tough for drives over 2 hours. The seats could be better for its class. I think Subaru remedied this issue in the new body style, however. The optional Tom Tom system came with my car because I wanted a sunroof. Subaru tends to package things together. I hate it. The navigation is pretty useless, the bluetooth function does not work, and it was not designed to be easily used. If you get an Impreza, skip the nav, get the stock head unit. Oh and the stock speaker cones are made of tin foil so be sure to swap those out as well. Over speeds of 65, you'll know your going fast. And the terrible Tom Tom will have to be cranked. Heavily. Overall, I love this car. There are many benefits to the handling characteristics. Its just fun to drive and for me that means a lot. It's given me many smiles and I always enjoy looking at it across a parking lot full of other lifeless front-wheel drive A-B mobiles.